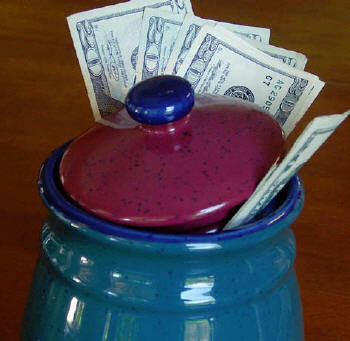 Money: Developing a Spending Plan With a "Virtual Cookie Jar"
From what I can tell, very few people today have a spending plan, or budget, to manage their personal finances. I’ve discussed this topic with many people who are hesitant to even think about starting a budget because they believe they don’t have enough to make ends meet. But ignoring reality won’t make our financial problems go away. truly need and are able to pay for and to make rational decisions about our spending so we can make ends meet. The wide availability of credit, including balance transfers and deferred interest, has made managing finances even more essential. That’s because using credit makes it easy to spend more than we are earning. This can lead to a real financial mess! It is important to address this issue as soon as possible before we get over our heads in debt. envelopes to pay the bills. My wife told me how her mom used to take the cash from every paycheck and divide it into separate envelopes for family expenses such as food, utility bills and an offering or tithe for church. With five children in the family, things were really tight, but by managing the family income in this way, they were able to survive. The idea of putting cash from our paychecks into a cookie jar or envelopes may sound old-fashioned, but the truth is that most people would be better off to follow this principle. income. This should include all forms of income, such as salary, pension, and investment income. such as food or entertainment, over which we have a greater degree of control. Examples of fixed expenses include a monthly mortgage payment or rent, car insurance, utilities, a commitment to charitable giving, and annual payments, such as for life and disability insurance. Estimate what your annual expenses are for each category, and then divide the total by 12 to calculate your average monthly fixed expenses. What if your expenses greatly exceed your income and you just can’t make the budget balance? Then you will need to find a way to increase your income and/or reduce your ongoing expenses. This may require making some difficult decisions, but there is no other option if you are to make ends meet. your expenses when they come due. If you do this “virtually,” electronically, then the funds should be deposited into a bank account and you should track the amount for each category on a spreadsheet or in a notebook each time you make a deposit or expenditure. You may find this worksheet helpful. It is based on one I use. Why not download the Word format document from our website and adapt it to your own situation? budgeted in any category, then the spending plan works well. something that is not in the budget. This means that we will have to cut back expenses in another area, or use savings to cover the deficit. It is important to revisit your spending plan often—especially in times like these when inflation is causing certain items to rapidly get more expensive. Recently we made some adjustments in our budget to accommodate the rising cost of gas and food by cutting expenses in other categories. As a family, we discuss our spending plan and include our children on certain decisions, such as how to spend our vacation and entertainment allotment. Also, we give our children an allowance and expect them to use it to pay for their own entertainment and toys. This has been a great teaching tool because they have learned to save money for things they really want. Fellowship Church in Cincinnati, OH.